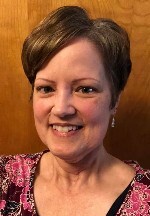 Patricia S. “Patti” Hamilton, 57, of Belleville, IL, passed away peacefully at Barnes Jewish Hospital, St. Louis, MO, Tuesday, January 29, 2019, after a well fought battle with multiple myeloma cancer. She was born on June 8, 1961 in the Chicagoland area to Shelby and Mary Lou, nee Kording, Hamilton. She has two sisters Cindy Kaemmerer of San Diego, CA, and Kelly Austin of Highland, IL. She graduated from Belleville East in 1979, attended Eastern Illinois University and graduated from SIU-Edwardsville with a bachelor’s degree in Speech Pathology. She worked at Memorial Hospital for several years in medical records, information technology and cancer registry capacities. She loved to read, to cross-stitch, to build puzzles and to cheer on her STL Blues. She loved to vacation in San Diego and spend hours enjoying the beach and watching the ocean waves. To her four nieces she was the consummate “Aunt Patti”, and her girls were the joy of her life. She was preceded in death by her mother, Mary Lou, nee Kording, Hamilton. and many, many, aunts, uncles, and cousins. Memorials may be made to the Multiple Myeloma Research Foundation, P.O. Box 414238, Boston, MA, 02241-4238, or online at themmrf.org. Condolences may be expressed to the family online at www.rennerfh.com. Visitation: Local friends may visit from 1 to 5 p.m. Saturday, February 9, 2019, at George Renner & Sons Funeral Home, Belleville, IL. Funeral: Private family service will be held at a later date. We are so sorry to hear about Patti. She was a Junior Board member last year for the Missouri State Tumor Registrars Association. We will certainly miss her as a member of our association. She was very sweet and fun loving. I had the opportunity to spend time with Patti at the Annual meeting in Kansas City in October 2017. Our thoughts and prayers are with Patti's family and friends. God bless Patti's family during this difficult time. I am so very sorry to hear of Patti's passing. All of the Hamiltons will forever hold a special place in my heart...my childhood is filled with memories of your wonderful family. I will keep you all in my prayers...God bless you. So sorry to hear about Party. The Hamilton's were our next door neighbors for years and our family loved all of you. It is with heavy heart that I express my sincere condolences to the family of one of my favorite students. I was Patti's medical records program coordinator at BAC. She was a member of my first graduating class in 1990. She was also one of my STELLAR STAR students due to her personality, smartness, common sense and our spiritual connection. She truly made footprints on my heart. I was most proudest of her work in the profession, volunteering to take practicum students, excelling in all that she did and being the exemplary dedicated worker. Rest in Peace Patti your heavenly rewards are on the way. I'm so very sorry to hear this and my deepest condolences go out to all of you. Although we moved away when I was young all of the Hamilton's made such a huge impression on me and I think of you all often. I'm so sorry about this. shelby verry sorry to hear about you daughter . My deepest sympathies to Patty's family. I used to work with Patty at Dr. Feder's office years ago. Patty was one of the sweetest and kindest persons I have known. May God bless your family richly! I am so sorry to hear of Patti's passing. She and I met through the Southern Illinois Health Information Management Association many years ago. She was a lovely person and I felt honored to be a friend. I'll miss seeing her. Mr. Hamilton, Cindy and Kelly, I worked with Patti at Memorial Hospital for many years. My favorite memory of her will always be a trip to Indianapolis we shared to a conference when during that road trip we dubbed doppler radar stations "space-balls" and I learned of her love of cows which resulted in my providing her with "Sue Cow". I loved her dimpled smile and wonderful sense of humor as well as her gentle kindness. I am certain she is basking in the Son-light of His glory now! Praying for you all as you celebrate her life and grieve her absence. Shelby, Cindy and Kelly, So so sorry about Patti. The absolute hardest to lose is your child and sister. she is in a better place and with Mary Lou. We will all meet again some day, this we know. Shelby, so sorry to hear about your loss. As a cherished neighbor, we are praying for you and your family and here for you. May you feel the loving embrace of God. Patti and Mary Lou are hugging each other. Words seem useless to try to explain the hurt and sense of loss for those of us left behind. I am so very sorry for all her friends and family as we all deal with this hurt. She was a truly good person. I love you, Patti, and will never forget you. So, sorry for your loss of this wonderful person in your family. Patti was a wonderful friend, a great party planner and a tremendous co-worker. She will be sorely missed everyday. She fought the good fight to the end. I am thankful she is now free from pain and suffering. I am truly sorry for your lose. She loved her family and would speak of you often and loved spending time with you. Patty and I have been great friends since 2005. We both were CTR's and would occasionally share hotel/travel accommodations to attend Cancer Registry and HIM conferences. She was an absolute amazing friend and I will truly miss her everyday.